In the course of our practice, we often meet with clients who are in obvious pain following automobile collisions in which the damage to their cars is “minimal.” Large insurance companies, such as State Farm, Allstate, and Geico, consider these claims to be “MIST,” or minor impact soft tissue claims. Such claims rarely garner compensation substantial enough to account for bodily injury. 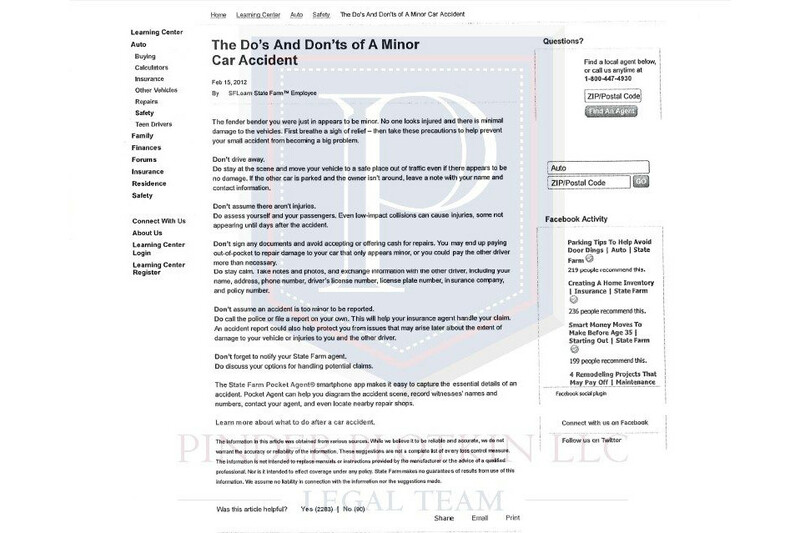 In 2012, State Farm published an article titled, “The Do’s and Don’ts of a Minor Car Accident,” that has since been removed from its website. Though each item on the list is noteworthy, one that states, “Don’t assume there aren’t injuries,” explains that injuries can be caused by low-impact collisions and may take a few days to develop. This is an important advancement in terms of how car accidents are handled by insurance companies, as State Farm is confirming what many personal injury attorneys already know to be true. Our own Jason Plotkin was involved in two serious car accidents since becoming an attorney. Because of his personal experience in dealing with the complexities of insurance claims, Jason is able to approach each case with an intimate knowledge of how his clients are feeling. That, coupled with his legal experience, will allow him to fight for fair compensation and necessary medical treatment in your case. To learn more about Jason’s story, watch his video. Even low-impact collisions can involve complex legal issues, and you shouldn’t have to handle them on your own. The legal team at Pinder Plotkin has years of experience advocating for injury victims, and is here to advocate for you while protecting your rights. When you choose us to represent you, we’ll handle every aspect of your case so you can focus on your recovery. For personal injury claims, our contingent-fee policy ensures that you won’t pay any attorney’s fees or expenses unless we achieve a financial recovery for you. We also offer free initial consultations, so there’s no risk in contacting us immediately from the scene of the car accident or the hospital. Please call us at (410) 661-9440 or fill out our online contact form to speak with an attorney and discuss your legal options.